Please note that all reactive glazes are subject to variation including color, amount of coverage. These glaze variations are not considered a defect, but part of the charm of a hand made product. Returns will not be granted for glaze variations. Can be used indoor or outdoor above freezing temperature. Ceramic will crack in below freezing conditions. 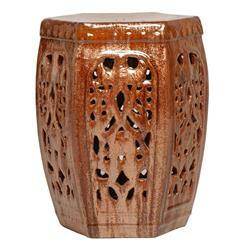 Traditionally used in China as tea tables- these garden stools make a perfect addition to your living space as side tables, or clustered together to be used as a coffee table. Glazes are triple fired for added luster and shine. With a hand made product, glaze variations of up to 10% is to be expected.